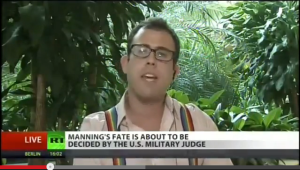 Reporter James Kirchick was kicked off the air of Russian TV Wednesday after he refused to talk about Bradley Manning and instead spoke about the Russian government’s anti-gay laws. “Being here on a Kremlin-funded propaganda network, I’m going to wear my gay pride suspenders and speak out against the horrific, anti-gay legislation that Vladimir Putin has signed into law,” Kirchick said. RT is funded by the Russian government, which recently passed a sweeping law that bans the public discussion of gay rights and relationships in the presence of children. “You have 24 hours a day to lie about America, I am going to tell the truth with my two minutes,” Kirkchick went on to say after RT hosts tried to cut him off.